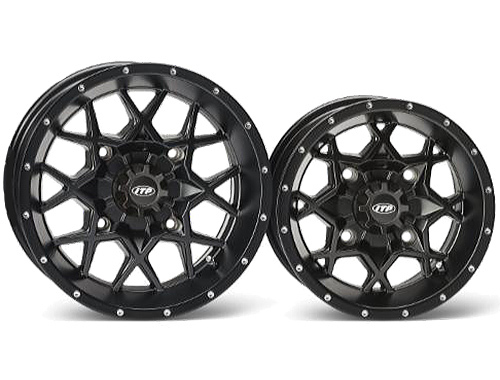 The first wheel in the new "Storm Series" product line from ITP has arriaved, the Hurricane Matte Black Wheel! The Hurricane is possibly one of the strongest UTV wheels on the market today! ITP credits the wheels exceptional strength to the interlacing of the center spokes forming an 'X-Shaped' pattern. The eight sets of X-shaped wheel spokes also makes it distinctively different. Heavy Duty UTV/ATV Wheel - 1200 lb Load Rating! The above part numbers are listed for your reference only to show all wheels available. Not sure about your particular bolt pattern, click here. Wheels are sold individually. Prices vary by wheel size, and start at $79.95.